The ever blooming Ixora is a great tropical hedge. When a northern European moves to the tropics he has to learn about new plants from scratch. Many adorable plants from his home region may not grow well here; they may die or become stunted dwarfs. Changing continents is an excellent opportunity to enhance one’s knowledge about plant life on Earth. Hedges are often appreciated in ornamental gardens, either as informal cascade hedges to provide screens, or neatly pruned low hedges to mark boundaries of garden rooms. Boxwood (Buxus sempervirens, Buxaceae) is commonly used in warmer parts of Europe and subtropical species could perhaps be used here in Chiang Mai in northern Thailand. I challenge our readers to make experiments and report their results. A tropical substitute for boxwood, actually even more beautiful and without the somewhat annoying smell, is the Ixora genus (Rubiaceae). Some hybrids and garden cultivars are equally easy to prune into compact forms, while others grow tall and more leggy. A special delight with Ixora is the blossom which comes in white, yellow, orange and red. Some cultivars are almost ever blooming and their nectar attracts butterflies, although this is not their first choice. The experience from Dokmai Garden is that it resists water logging very well, and frequent watering does not seem to be a crucial issue either. If you like a strict formal hedge you can easily prune it, but to save time or money you can allow it to grow more freely and thereby obtain more blossoms. 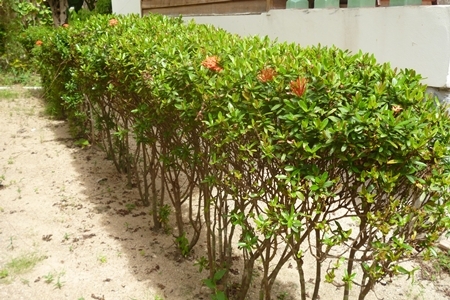 When planting it, small 10 Baht cuttings are sufficient, which should be planted in double rows at 50 cm distance. It is tolerant of poor soils, but a 10% addition of organic matter (compost) is appreciated. Generally, addition of nitrogen promotes green growth, while a reduced diet would increase flower formation. [email protected] www.dokmaigarden.co.th.